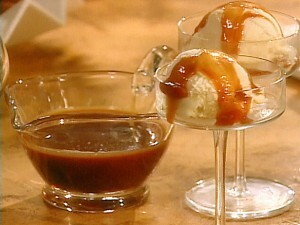 This is the best homemade caramel sauce I have ever had. You have gotta love the Barefoot Contessa. I am a huge fan!! Forget that crappy jar sauce. This is so worth the 15 minutes it takes to make it. Mix the water and sugar in a large heavy-bottomed saucepan. Watch it carefully at the end, as it will go from caramel to burnt very quickly. Stand back to avoid splattering, and gradually add the cream and the vanilla extract. Simmer until the caramel dissolves and the sauce is smooth and thick, about 2 minutes. Serve warm, or add another 1/4 cup of heavy cream and serve room temperature.